Funky First Grade Fun: Check it out: Sight Word Poems! back in the classroom after my surgery! exactly like they did on the day you left. all throughout my first few days returning. My students made me welcome back cards and letters and pictures! This sweet little note made me cry. by Jodi from Fun in First Grade! You can check them out by clicking on the image below and it will take you directly to Jodi's store. 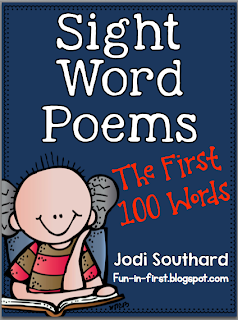 What do I love about Jodi's Sight Word Poems? I'm always looking for things for appropriate reading material for my first graders to read. Jodi's Sight Word Poems each focus on a different word. The poems are based on the first 100 Fry words. There is one poem for each word. They can really be used no matter which sight words you teach your students. For example, my school uses the Dolch words, but the words are so similar that I will be able to use all of her poems to fit with my sight word lessons. In fact, I already sorted a set into my spelling bin by lesson (excuse the messy papers popping out of some folders). The font she used is perfect for my readers and I know my students will be excited to illustrate the poems! Here is sample that my son (who is in 2nd grade) snatched out of my pile. I am planning to keep the poems in a folder for each student, in the order that the words are presented in my spelling program. By keeping them all in one place (like I do with my personal reader stories), the students will be able to reread them multiple times for extra reading practice. I'll also have the students highlight the "focus" sight word in each poem. I often ask my students to highlight word family chunks and sight words before they read a passage. That helps them focus on the words and/or chunks before they attempt the reading and it improves their decoding. Thank you, Jodi, for another fabulous product to use with my students! If you have not already checked them out, I recommend that you check them out soon. Now, back to resting to save up my energy for day 3! You are so welcome! They are perfect for my students!